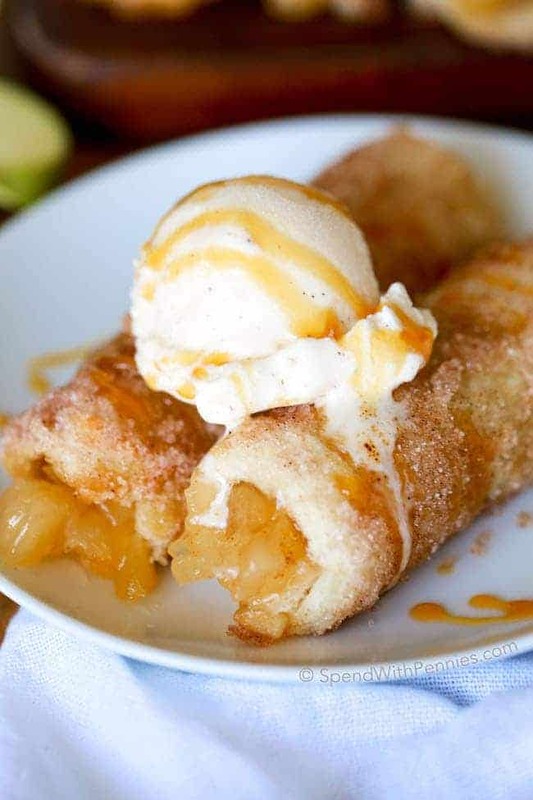 Baked Apple Pie Roll Ups are oven baked and take just minutes to prep. 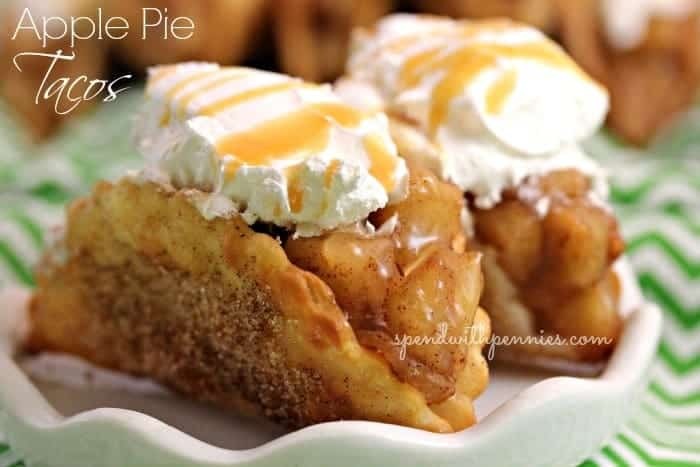 Warm crispy cinnamon sugar rolls with a sweet apple pie filling will become a family favorite. 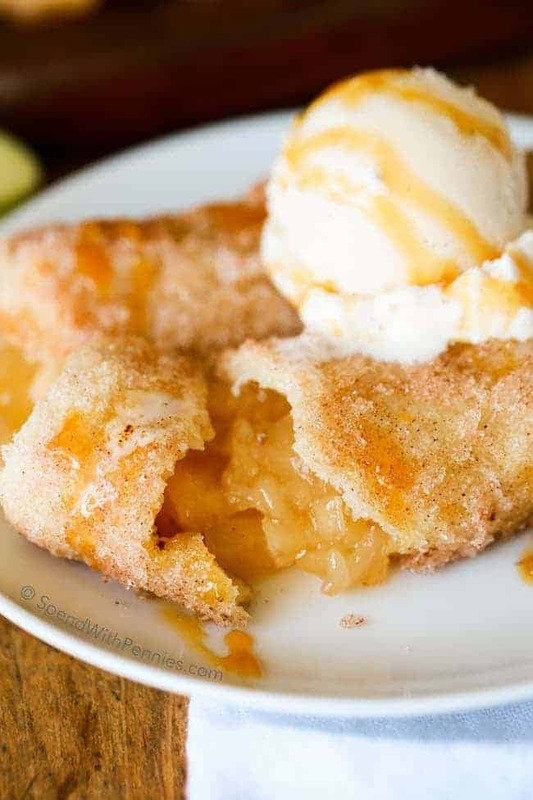 Top them with ice cream and caramel for a perfect weeknight treat! 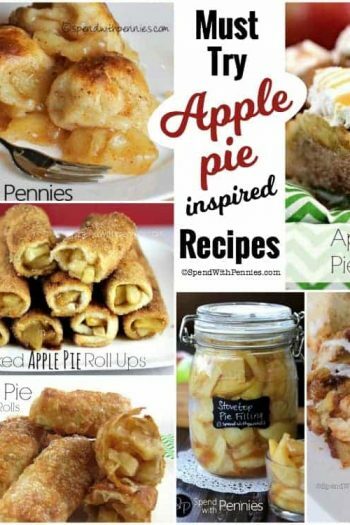 Spend With Pennies on Pinterest for more great recipes! 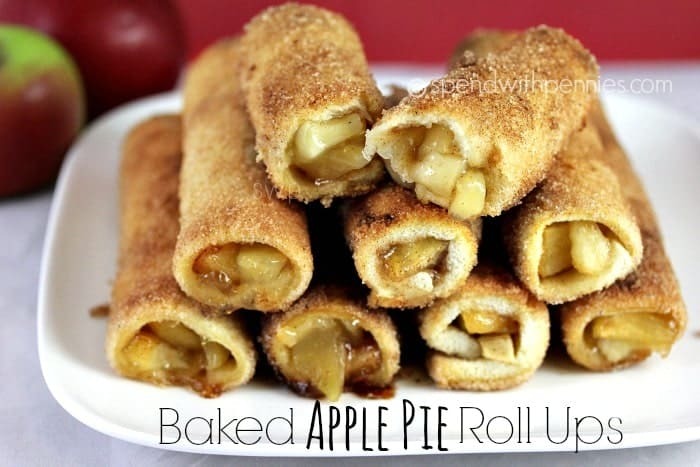 Baked Apple Pie Roll Ups are super simple to put together with just a few ingredients you likely already have on hand. I love that these are oven baked and not fried and take just minutes to make! 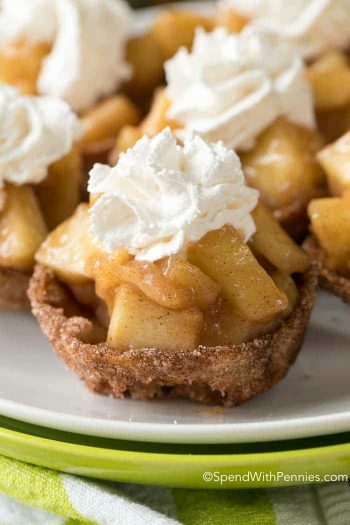 While I used apple pie filling, you can fill them with whatever you’d like including cream cheese & sugar or cherry pie filling. 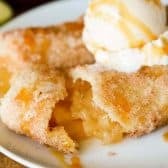 If you’re in a hurry you can certainly use canned apple pie filling but if you’ve got a few minutes you can quickly make your own! 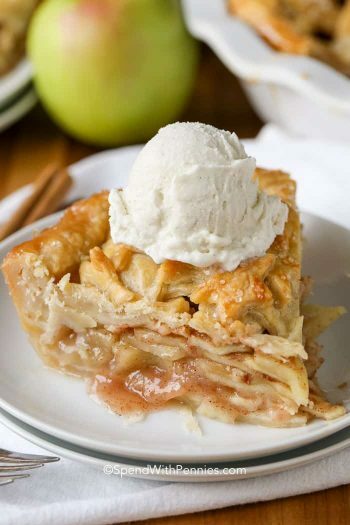 I’ve added my own homemade apple pie filling recipe to the site! 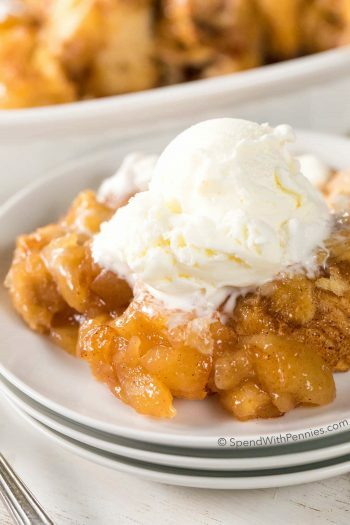 This easy recipe is made on the stove top and makes the equivalent of one store bought can of pie filling! 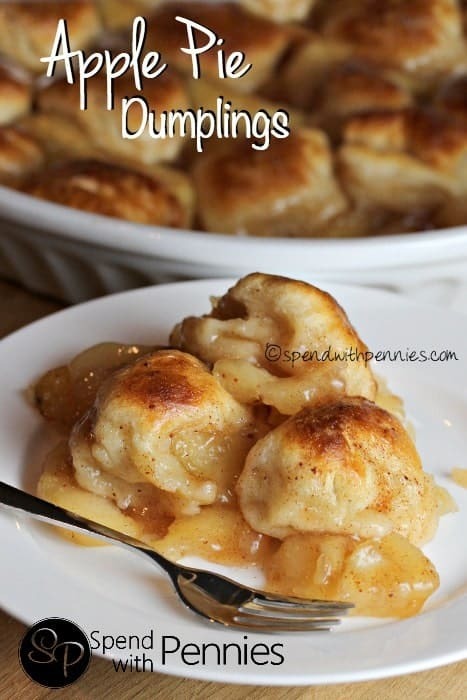 My daughter loves these and we make them often because they’re so quick and easy. When placing your roll ups on your pan, be sure the have the seam side down. Once they come out of the oven if you notice the shape is a little bit flat, you can just give them a gentle squeeze while they’re warm and they will hold their shape as they cool. We serve these as is or with ice cream and caramel. Cut the crusts off your bread and roll each slice flat with a rolling pin. Combine cinnamon and sugar on a small plate. 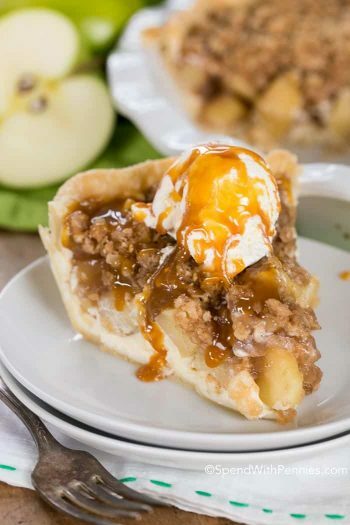 Pour the apple pie filling onto a plate and chop it so the pieces are smaller. 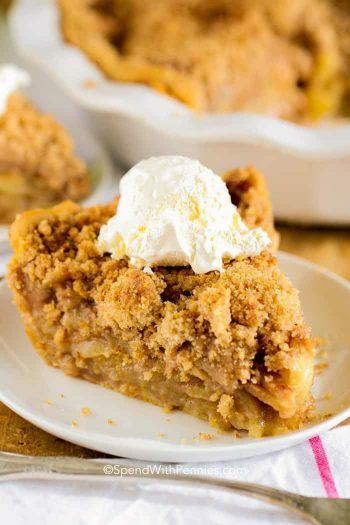 Place 2 tablespoons apple pie filling on each slice of bread and roll up. Dip each roll into melted butter (I poured a tiny bit of butter into a “butter dish” and just rolled in there) and then roll in the cinnamon sugar. Place seam side down on a parchment lined pan and bake 15 minutes or until browned and crispy. Serve warm.